Tracy June Kirkland, 42, allegedly used RootsWeb.com to find the names, Social Security numbers and birth dates of newly deceased people, randomly call credit card companies to find an account, and then have the mailing address—and in some cases the account name—changed to her own. RootsWeb spokesman Mike Ward says the company sometimes hears rumors or speculation about people using the Social Security Death Index (SSDI) for identity theft, but this is the first prosecution he's aware of. "The reason the Social Security Administration has it out there is to prevent fraud," says Ward. The government produces the Death Index so that banks and other lenders can prevent people from applying for credit using a dead person's information. Kirkland allegedly exploited a weakness in current safeguards by taking over accounts that were already open. TGN's MyFamily.com website has been nominated for a Webby Award. For information on voting, go to the MyFamily Blog. The posting there drew some very interesting user responses. Registering on the Webby website before 1-May-2008 automatically registers you in a contest to win one of ten Nokia N95 smart phones. Registration requires disclosure of your e-mail address and creation of a username. For me the biggest risk was not Nokia getting my e-mail address. It was the time I wasted tooling around the nominated websites. I spent 2 hours in only 1 of the 70 categories. I gravitated right to the "Weird" category under "Connections." Highly recommended. Even if you don't have a weird sense of humor, you'll still enjoy the "Cute Overload" nominee. After the Ancestry/Buick Sweepstakes, I guess Ford didn't want to be outdone. Enter the Ancestry/Ford "Meeting David Wilson" Sweepstakes for a change to win one of 200 Ancestry.com DNA test kits or 800 Ancestry.com 30-day subscriptions. Your entry must be submitted before 21-June-2008 at www.fordurban.com/ancestry. Lots of job postings have shown up recently for the Generations Network (TGN). One is an Indexing Project Coordinator to coordinate with international keying vendors. I'm gland TGN isn't planning on using volunteer indexers exclusively. Also interesting to me, 4 positions are located in San Jose, including a software engineer position to work on DNA Ancestry. The pool of available software engineers in Utah is small, but expanding engineering work beyond the valley is always met with suspicion. I came across another TGN employee blogger, Cameron Evans on the Ecuablog. I harp a lot on these pages about the need for employers to implement a specific blogging policy. I assume TGN feels its existing employee policies are sufficient, which they are. My agenda, however, is prevention of abuse so that TGN in particular and employers in general don't have problems that cause them to forbid employees from blogging about work-related topics. Take the case of Ecuablog. Evans' post of 28-March-2008. In relating the story of getting hired, he mentions the specific amount of a hiring bonus. Now most people know that any public disclosure of any part of one's compensation package is against policy in any company. But something about blogging makes people forget they are in a public forum. And once out there, it propagates forever. In my opinion, companies should have a good company blogging policy as a substitute for a good slap up the side of the head. "Hello, McFly. Anybody home?! Nothing is private on the web. Nothing!" 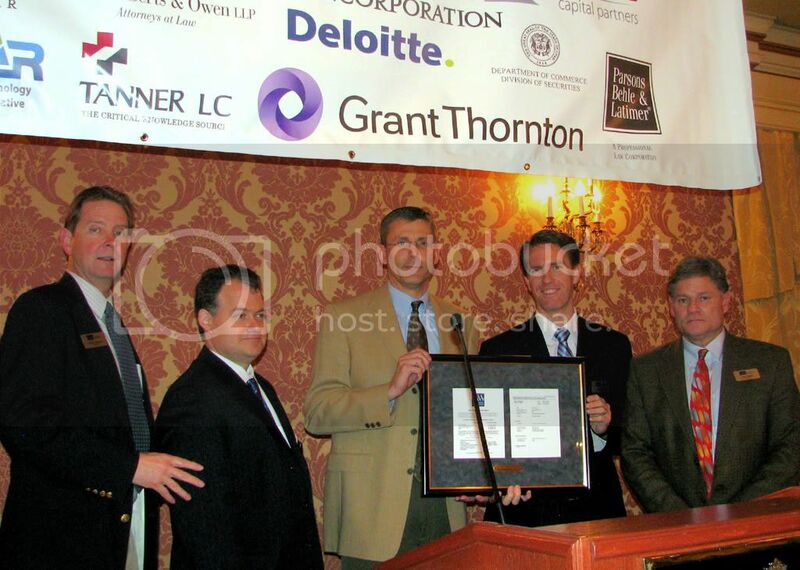 TGN was recognized by the MountainWest Capital Network in a luncheon held 20-March-2008. 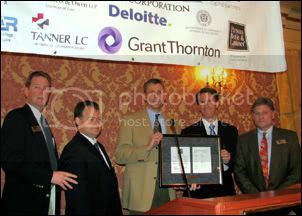 Generations Network (Ancestry.com), provider of online genealogical research, was recognized for a successful $300 million dollar deal (purchase of a majority interest) by Spectrum Equity Investors in December 2007. David Sampson, Controller of The Generations Network, accepted the award on behalf of the company. David Sampson, TGN Controller, in tan coat. A previously undisclosed detail of the TGN/Spectrum deal was made public in a press release from Hercules Technology Growth Capital, Inc.
[Hercules participated] in $150 million syndicate financing for The Generations Network, Inc., an online network of family history Web sites. Hercules provided $17.5 million in debt and $500,000 equity capital in December 2007. You probably don't care about the following items, but I'm on a roll! I'm clearing my files of TGN mentions in the news. Ryan Bonnett, IT Administrator for TGN, was quoted in a press release about a storage monitoring product, 3PAR and Tek-Tools. Hypothetically speaking, would such a product make it possible to detect storage-full conditions that would prevent users from uploading images to... say... the MyFamily.com website? Hypothetically. This bullet is definitely boring. Ancestry and TGN are mentioned several times in a press release titled "Interevco Launches Web Site Incubator Division." Unless you're looking for a firm to help you increase your web-based advertising, this one's a real yawner. And with that, I'm caught up. Whew!